Due to natural wear and tear, even the most durable illuminated business signs will eventually lose their ability to light up. There are a number of reasons for this. Many business owners fail to fix the issue because they assume it will cost too much. Yet, you cannot afford NOT to fix your markers. 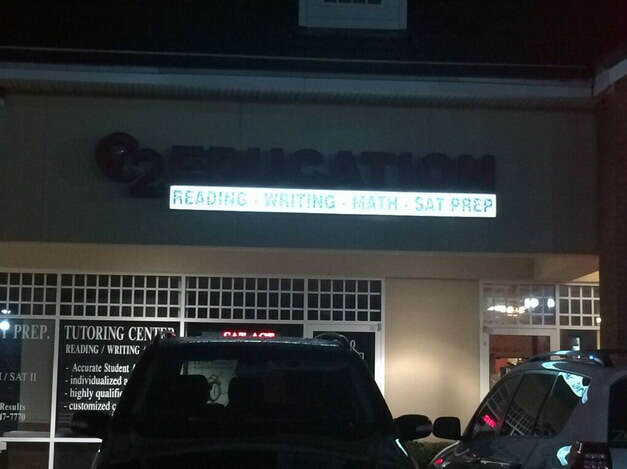 C2 Education realized this, so they called in the friendly professionals at Citrus Sign Studio for exterior illuminated sign repairs for Orlando, FL. This sign wasn’t lighting up properly. 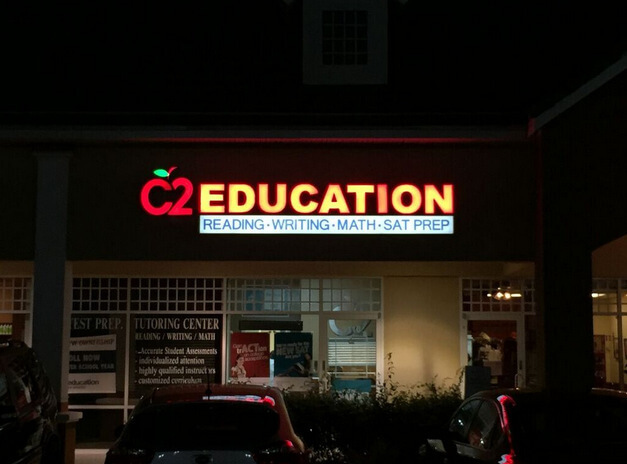 Located on Dr. Phillips Boulevard in Orlando, C2 Education is one of the country’s fastest-growing networks of SAT/ACT test help, educational support, and personal tutoring centers. They provide personalized attention, a broad range of enrichment services, and customized curricula for students in middle school, high school, and elementary school. C2 Education is part of a network that serves more than 12,000 students and their families each week in their over 100 centers nationwide. When an organization that does so much to help our youth succeed came to us for exterior illuminated signs in Orlando, FL, we jumped at the chance to help. Due to the nature of their organization, C2 Education is regularly open after dark. Unfortunately, their illuminated channel letter sign was not lighting correctly and clients were having trouble finding them at night. Fortunately, we knew just what to do. Now the sign shines brightly again! When they first contacted us, C2 Education was not sure if they would need a whole new sign or if we could simply repair it. Our first step was to listen to their goals for the project and to inspect their existing marker. When we arrived, you could not see the channel lettering at all at night. We took the marker apart to get a closer look at the guts. We found that the neon sign simply needed a new transformer. We acquired a new transformer for the sign. 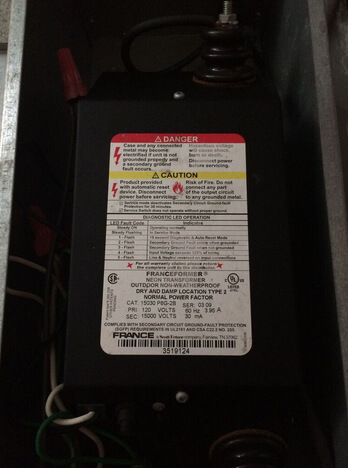 Our technicians are trained in performing electrical work, so it was only a matter of scheduling a convenient time to install the new transformer when it would not disrupt C2 Education’s business. We had the transformer in there in no time. Now, the client is easy to find after dark, and they are able to use their signage to attract new customers. They were completely satisfied. When we drive around Orlando at night, we get a kick out of what busted illuminated signs say about companies. For instance, there was a mattress company in town that needed new wiring in the “ATT” of their sign. So, it read “M ESS COMPANY.” We thought that was fitting. Thankfully, they have fixed this problem. Are customers having a hard time finding your enterprise at night? Are your signs telling potential clients that you are a mess of a company? Do not let this happen to you! Contact Citrus Sign Studio today for a free quote on sign repairs. We will have you looking your best and attracting consumers in no time!